Peak fall color in Abingdon and the Blue Ridge Mountains varies year by year, depending on factors like temperature and yearly rainfall to date. Typical peak fall color for the Blue Ridge Mountains is mid-October, but higher elevations will see leaves change early, and valleys will be slightly delayed. The Virginia Department of Forestry provides weekly fall foliage reports, beginning in late September. Visit Virginia.org for more information, or call Virginia’s Fall Foliage Hotline, at 1-800-424-LOVE. 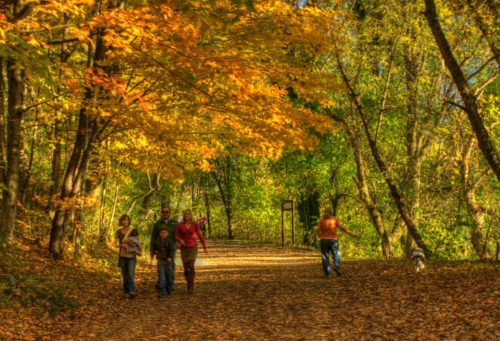 Begin your day with a ride on the Virginia Creeper Trail, a 34 mile hiking, biking and horseback riding trail. The fall season brings perfect temperatures and unbelievable scenery with an abundance of autumn color. 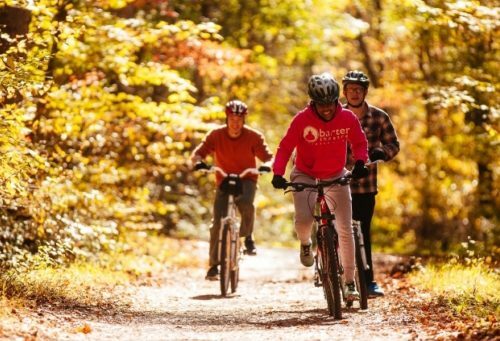 Rent a bike or bring your own, take a shuttle to the top of Whitetop Mountain and coast downhill through Jefferson National Forest. Between Abingdon and Damascus, a short distance off the trail in Alvarado you will find Abingdon Vineyards, Washington County’s first Virginia Farm Winery. Hop off the trail to recharge your batteries with a wine tasting and lunch on the serene outdoor patio overlooking the South Holston River. After an active day of adventure, unwind at The Martha Washington Inn & Spa, a historic 4-star inn originally constructed in 1832. Enjoy a cocktail on the wide front porch, overlooking Main Street, or schedule a massage at the Martha’s day spa to work out those kinks from the day. Next, make plans for dinner at one of Abingdon’s independent restaurants, almost all of which are located an easy walk from The Martha. Abingdon’s culinary scene ranges from home-style southern comfort food to sophisticated fine dining. Look for the Rooted in Appalachia designation, indicating restaurants that source their ingredients from local farmers, guaranteeing dishes that are always fresh and in season. Pick up a picnic lunch from Amy's Idle-In Cafe, and head out for a driving tour of Southwestern Virginia’s fall beauty by traveling State Highway US 58 toward Damascus. Stop off in Damascus for a day hike on the Appalachian Trail, which runs right through downtown, or continue on to Whitetop Mountain and Mount Rogers– the two highest mountain peaks in Virginia. Mount Rogers National Recreation Area offers great hiking, camping, picnicking and horse trails, and a chance to see wild ponies grazing on the high mountain balds. That evening, take in a show at the historic Barter Theatre, founded in 1933 during the Great Depression, when actors bartered an evening’s entertainment for food from local farmers. The theatre now performs year-round in three venues on Main Street, offering Broadway-quality professional performances. Stroll the tree-lined brick sidewalks of the historic downtown district; enjoy the vibrant foliage while taking a self-guided walking tour. Explore the various shops and boutiques along Main Street and find unique gifts, Virginia wines, tea parlors, art galleries, an olive oil tasting room, and studios that showcase local artists. The award-winning Abingdon Farmers Market is in full swing during September and October, with fresh local produce like sweet peppers, tomatoes greens, pumpkins and pasture-raised meat. Stop by the Arts Depot, located in a historic train station, and watch as local artists work in their studios, or shop at Holston Mountain Artisans, one of the country’s oldest craft collectives. For happy hour, check out Wolf Hills Brewing Company and enjoy a craft brew and live local music, then walk over to The Tavern to enjoy fine dining in an original inn & tavern built in 1779. The 34.3-mile Virginia Creeper Trail was named after the steam engine that once crept up the rails into the Iron Mountains.